Queen Latifah, Forest Whitaker, Adam Driver, Daniel Craig, Gillian Jacobs, and Jason Bateman were all in town this month. Did you spot any of them? 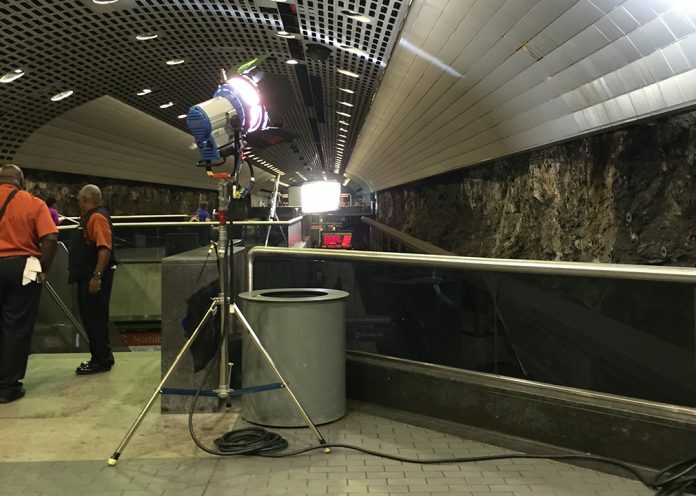 A light illuminates the set for 24: Legacy in the Peachtree Center MARTA station. A new spin off of the 24 series, 24: Legacy (production code: LEGACY) began its run this month. The upcoming FOX show will star Corey Hawkins, who you may recognize as Heath from The Walking Dead, as well as Miranda Otto (Éowyn from Peter Jackson’s Lord of the Rings) and Jimmy Smits (Bail Organa from the Star Wars franchise.) On-location filming began in late September in Buckhead before moving to downtown Atlanta on September 27 off of Luckie Street. On the 28th, crews worked on the Peachtree Center MARTA station platform, giving commuters an up-close look at filmmaking. In early October, additional shots were captured back up in Buckhead. Also new is Star (SOS). Well, technically it’s not that new. We first caught wind of this one back in January when a pilot was filmed in town. Now, a 13-episode order is being shot for FOX. Starring Jude Demorest, Queen Latifah, Ryan Destiny, Brittany O’Grady, and Benjamin Bratt, the show focuses on three singers (played by Demorest, Destiny, and O’Grady) as they navigate the music business in Atlanta. Star was spotted at The Gold Room on September 28. In early October, signs were placed at the corner of Peachtree Dunwoody Road and the Glenridge Connector. On October 15, crews worked at Emory’s Briarcliff campus. Most recently, more signs were spotted at Freedom Parkway and Ponce, as well as off of Fulton Industrial Highway. Hap and Leonard (H&P), the SundanceTV dark comedy staring Michael K. Williams and James Purefoy is shooting its second season. This production is new to Georgia—the first season was filmed in Baton Rouge, Louisiana—and has been largely filming outside of Atlanta, shooting in Douglasville on October 5, Union City on October 15, and in Austell on October 19. The show’s first season also featured Mad Men actress Christina Hendricks, but there’s been no official word of her involvement in season two so far. If you live in the far outskirts of the metro area, keep an eye out for Burden (PUMP), a movie that stars Andrea Riseborough, Forest Whitaker, and Garrett Hedlund. The film tells the story of a young man raised within the KKK, who escapes from the Klan with his girlfriend. The two are taken in by a black church congregation, which protects them when the Klan retaliates. Burden was spotted in Flovilla on October 11 and in Jackson on October 17. Forest Whitaker’s other Atlanta project, Finding Steve McQueen (FSM) continued shooting this month. The heist thriller ended September in a studio in Norcross, and set up a basecamp at Mt. Bethel United Methodist Church on October 7. The next day, they traveled out to Powder Springs. Between October 10 and 12, crews returned to Marietta to film at the Earl Smith Strand Theater. Speaking of heist movies, Logan Lucky (TRP), starring Sebastian Stan, Adam Driver, and Daniel Craig, was spotted on September 21 at the Atlanta Motor Speedway. A few days later, crews worked in Grant Park. In early October, signs were spotted in Johns Creek at the corner of Medlock Bridge and Old Alabama Roads. A basecamp was set up nearby at Perimeter Church. Melissa McCarthy’s Life of the Party (GLADYS) is another holdover from last month. The adult-gone-back-to-school comedy opened October at J R Crickets on North Avenue. Between October 5 and 6, the production shot college scenes at Agnes Scott College in Decatur. Crews moved to Covington between the 11th and the 14th. The movie filmed in Liburn before the moving back to Atlanta on October 20 for a shoot at The Optimist. The fourth installment in the Diary of a Wimpy Kid film series, Diary of a Wimpy Kid: The Long Haul (DWK), began production just before our last round-up last month. Since then, a fake “Corny’s” restaurant was constructed in Norcross for the movie. Crews finished filming at that set in September, then began a whirlwind tour. The production was spotted downtown on October 5th and 6th, then traveled to Jonesboro on the 7th. On October 10 through 14, signs were spotted in Griffin. On the 17th, the movie filmed in Lithia Springs. Most recently, crews were in Roswell in the woods off of Bowen Road on October 20. CBS’s MacGyver (EYE), which just got a full season pickup, shot at the old Douglas County Jail on October 4. We also spotted them at Pullman Yard on the 14th, and downtown off of Ralph McGill Boulevard and Peachtree Street on October 22. Netflix’s Ozark (BYRDE), starring Jason Bateman, continued its OTP dominance. They finished up September at their Canton set, with a basecamp at the Little River Marina. On October 3, they shot in Jones Bridge Park in Peachtree Corners. The next week, crews worked in Milton, off of Union Hill Road. Signs were seen off of Windward Parkway for this shoot. This past week, production was back in Canton. Daytime Divas (DD) had a basecamp at the Brookhaven MARTA station in late September. They were also at the Riverside EpiCenter on October 4. The Case For Christ (C4C), a film based on the Lee Strobel book, was spotted in Covington on September 29. The Walking Dead (SF) worked off of Church Street in East Point on October 17. BET has two shows filming in town, Being Mary Jane (SNC) and The Quad (GAMU). The former was spotted at Skyline Park atop Ponce City Market at the end of September, and the latter was at Morehouse College on October 21. The Originals (TOGS) was in Conyers last week. Sleepy Hollow (SH) shot in Conyers in late September. Production also took place at the High Museum of Art on October 4 and at the Lawrenceville square between October 10 and 11. And finally, some very cool casting news. Just a few days ago, Disney and Lucasfilm announced that Donald Glover, the homegrown co-creator and star of FX’s massive hit Atlanta, will play a younger version of the Star Wars galaxy’s smoothest operator, Lando Calrissian in the upcoming (and as of yet untitled) Han Solo spinoff film. We personally can’t think of anyone better to take up Billy Dee Williams’ mantle. Let’s just hope someone doesn’t alter the deal.